Location, Inc. delivers the premier neighborhood report product available today. 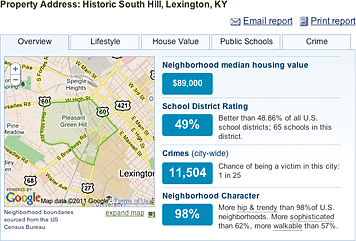 Like “CARFAX for Neighborhoods” according to Kern Investing, LLC, Location, Inc.’s Neighborhood Reports are built from the largest database of neighborhood statistics available today. Each report contains nearly 300 must-see statistics and provides revealing insights about any location, before you invest, or before your clients purchase or sign a lease making an expensive commitment. Reports are professionally formatted and tabbed by theme, with full complements of data on housing stock, lifestyle, crime, schools, and home values. The reports include a map of the property address and neighborhood boundaries that you can pan and zoom. Just enter an address and a Neighborhood Report is returned to you. Equally valuable for industries such as real estate, corporate relocation, REITs, corporate site selection, and direct marketing, among others. Can also be used for lead generation on large real estate websites. Access: These neighborhood reports can be pulled by address manually and auto-emailed to you or your clients, or automatically run direct server-to-server for large and ongoing report batches. They can also be spooled via API in a data stream to your servers, formatted or not, by street address or GPS coordinate. Full national coverage.